Now some of us are happy to settle with a good-old Mcdonalds burger or even upgrade to a Burger King if we feel like having a bit more meat in our bun! The Rossini burger is composed of Kobe beef, sautéed foie gras, shaved truffles, with madeira sauce on an onion bun. The burger is named after 19th century Italian composer ‘Giachino Rossini’. If you visit the San Francisco location, you will have to enjoy the burger without the foie gras after the statewide ban went into effect a few years ago. This Kobe beef burger features Maine lobster topped with caramelised onions, Brie, crispy prosciutto and 100-year aged balsamic vinegar. If you like to wash down your food with a glass of bubbly, you can order the Dom Perignon for an extra £465. The burger itself is made of Kobe beef and topped with foie gras and black truffles served on a brioche truffle bun, garnished with a sauce containing even more truffles. You can also order the burger with a bottle of 1990 Château Pétrus wine for an extra £3240. As part of the meal you’ll receive a certificate to prove that you ate the world’s most expensive hamburger and wine pairing. 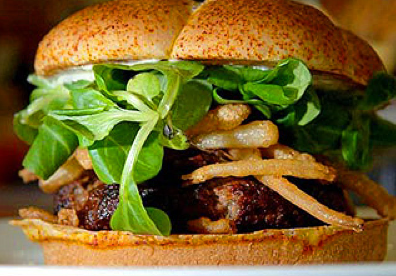 This unique burger was given a makeover by celebrity chef Daniel Boulud In 2007. It’s stuffed with red wine-braised short ribs (off the bone), foie gras, a mix of root vegetables and preserved black truffle and then a double serving of fresh black truffles to top off the burger. The burger is served on a toasted parmesan and poppy seed bun, along with a couple choice condiments, fresh horseradish and oven roasted tomato confit. This burger is filled with 3 different types of beef – American Prime, Japanese Wagyu and Argentine beef. The hamburger is also served with signature Chipotle ketchup which includes truffles and champagne ingredients. Chef Ciaran Hickey has created a burger made of Australian Wagyu beef, with seared foie gras and shaved black truffles on a brioche bun. The burger is topped with tomato, grilled red onion, fresh asparagus, wild pine mushrooms, and a lobster tail accompanied by a sauce selection of brunoise tomato salsa, dark red wine truffle sauce and truffle aioli. The ten-ounce Kobe beef burger is topped with black truffles, seared foie gras, aged Gruyere cheese, wild mushrooms and flakes of gold leaf. Like the Fleurburger, it is also served on a brioche bun. In 2008 Burger King decided to live up to its name and created a costly hamburger which was only available in West London, UK branch of the restaurant chain. The Burger King creation was made with Wagyu beef. It was also was decked with white truffles, onion tempura prepared in Cristal champagne and some of Spain’s finest Pata Negra prosciutto, filled in an Iranian saffron and truffle bun. The burger consists of a Japanese Waygu beef patty infused with 10 herb white truffle butter and seasoned with smoked sea salt. The cheeseburger features a cheddar cheese aged for 18 months by famed cheesemaker James Montgomery. No Expensive burger is complete without truffles, in this case shaved black ones. The burger also includes a fried quail egg, a blini, creme fraiche, Kaluga caviar on a white truffle-buttered Campagna roll. Created by Franz Aliquo and the 666 Burger food truck in New York City. 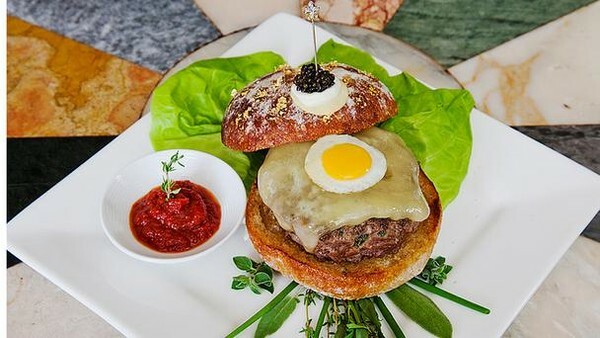 The cheeseburger features a Kobe beef patty wrapped in gold leaf, foie gras, caviar, lobster, truffles, imported aged Gruyere cheese melted with champagne steam, a kopi luwak barbeque sauce and Himalayan rock salt. This burger was featured in our ‘most expensive burger in the world‘ post. 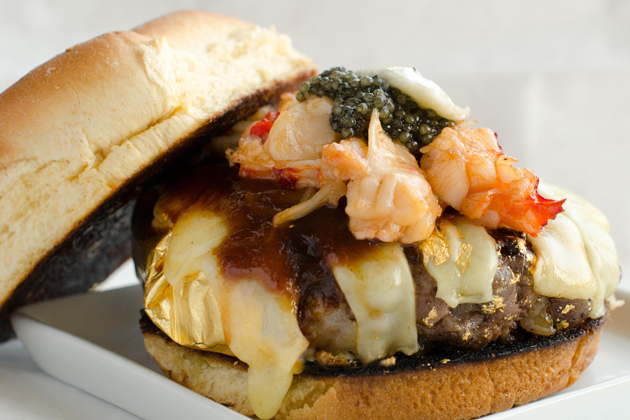 The golden bun is embellished in gold leaf’s, with a Canadian lobster, Kobe beef and black truffle brie filling. It apparently took Chris Large (Head Chef) three weeks to develop this burger.